Just got this in my inbox and thought I would share!! Yes, I admit, most of my post-baby clothes are White Stuff... but they are so lovely and flattering, I just can't help it. Thank goodness for the occasional sale. 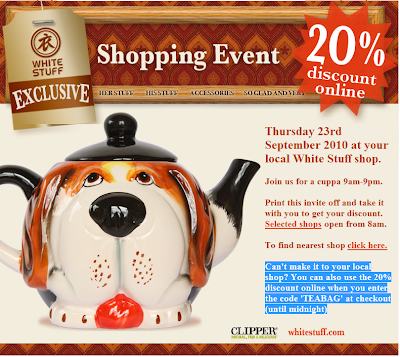 Until midnight tonight they are offering 20% off when you enter "TEABAG" at the checkout on WhiteStuff.com - enjoy!